When my mum and dad lived in a small town in north Western Australia, they used to find Gilbert’s dragons in their backyard all the time. These beautiful lizards grow up to 46 cm long, with their tail making up three quarters of their length. Gilbert’s dragons are also known as ta ta lizards, because it looks as though they are waving goodbye when they stop running. They are named after British naturalist John Gilbert, who was the first person to collect one in 1842. They are very fast runners and excellent climbers which helps them to run away from predators and catch their prey, which is mainly insects and spiders. They often run only on their back legs. 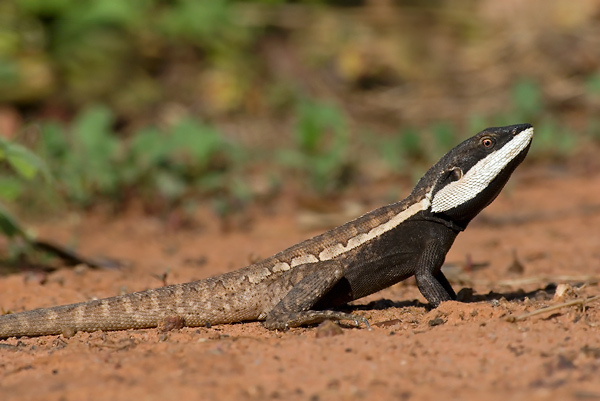 Gilbert’s dragons are very common and can be found near water or under cover in northern Queensland, Western Australia and the Northern Territory. Are there any other interesting facts that you would like to share about Gilbert’s dragon?